django-slowtest, nplusone and much more. 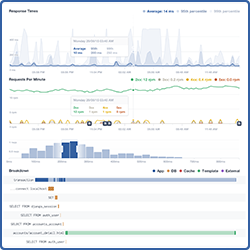 Opbeat have revamped their free metrics service, adding response time distributions, a full activity breakdown, and the ability to see the actual code that is slowing down the request, where is it called from & when it was committed. Read more. It appears that Django's simple_tag decorator for creating custom template tags does not run auto-escaping on its contents.The behaviour for this will be changed in Django 1.9, but in the meantime time to check your code that uses simple_tag to ensure your code isn't vulnerable. You sit down with your machine and a person who knows nothing about programming. What do you show them to try and prove that programming is fun? A tool for quickly creating REST and Hypermedia APIs in Python! This is a library for detecting the n+1 queries problem in Python ORMs, including SQLAlchemy, Peewee, and the Django ORM. Github within the CLI for you console nerds. Kerf is a time-series database. It also boasts being a columnar tick database for Linux/OSX/BSD/iOS/Android. It is written in C and speaks JSON and SQL. Setting up webpack and django for ease and profit! Last time we discussed gathering data from Google Forms. We will then be taking that data and visualizing it with Seaborn. Gesture Typing by Peter Norvig. Awesome IPython notebook answering some interesting questions about gesture typing! Awesome article on calculating Fibonacci for various criterion. Nice introduction on how to use Hypothesis to test your properties in your code base! Helps you find bug you wouldn't have otherwise, maybe. Informative article on Python descriptors.